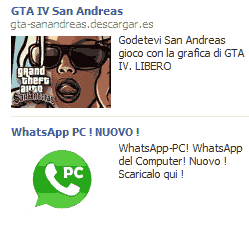 As you might have noticed on the last post, on Facebook there is an ad that promise you a free GTA IV San Andreas download. Are you curious to know what happens when you click it? I documented the installation on another blog, because it will install TWELVE adwares, the article is full of images and I didn't want to make Dandandin heavy to load. On Facebook I see this scam advertising everyday, by clicking you can download Whatsapp for PC: how does it work? The advertising is a scam: when you click it, a new windows will open and will ask to subscribe to a very expensive ringtone service. Once done that, we get the instructions page: the famous "Whatsapp per PC" it's just, an Android emulator. There is another way to get Whatsapp on a PC? If your account is old, there is, it's Wassapp, it's an unofficial client made by Waninoko, an (ex) Wii hacker. Now, this is the main reason to stop using Whatsapp: the username is your phone number, everybody knows it. The password is the IMEI, easy to find by dialing *#06#. This means if you lend the phone to your friend, he could find your Whatsapp credentials and be able to read and send message in your name, easily, from his home PC!!! An oil exporter backs an environmentalist movie? 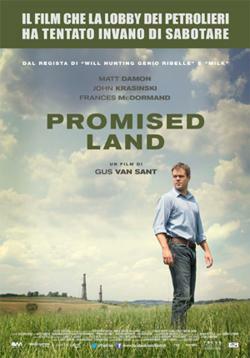 A few hours ago, while I was coming back to Italy by airplane I saw the movie Promised Land. The movie is about a big gas corporation that wants to drill the countryside. The obvious ending of the movie is that natural gas is essential and cleaner than oil, but extracting it with fracking it's polluting, so it's better to preserve the landscape. With the concessions money the quality of life will improve, but will it be worthy? After the ending I notice something: produced by Image Nation Abu Dhabi. I am shocked! Wasn't it "the movie that oil corporations did not want you to see"?? When I came back home I search more info: Image Nation Abu Dhabi is an Abu Dhabi Media division, controlled and financed by the United Arab Emirates government. Why a nation that has one of the biggest gas reserves should back an environmentalist movie?? The only reason I could find is to send this message: Americans, don't extract your natural gas, buy from arabs.